Buddhism, the teachings of the Buddha, are often referred to as the Dharma - the truth or wheel of the law. The execution of a craft is not just an economic compulsion but a sacred duty. It is believed that every individual is born to do his/her ordained work through which alone they can progress spiritually, and through the fulfillment of this Dharma to final Moksha or liberation. - The word "buddhism" comes from the Sanskrit word "buddha," which means "the awakened one".Buddhism, or buddhadharma, is the proclamation of, and journey toward, an awakening of human potential. - In the mysticism of Buddhism, Tara represents the mother goddess and the female personification of compassion. - In Buddhist thought, the God Realm, literally, the universe where the gods dwell, is a symbol of the nearness of heaven state of mind. Buddhism does not try to explain whether there is an ultimate God or not. Instead, the Buddha taught that we must strive through our own efforts to achieve liberation from anguish and suffering. - Buddha spoke of an Eightfold Path to Enlightenment which is traditionally represented as an eight-spoked wheel. The path is a guide to living life compassionately and non-violently. Lamaism - Tibetan Buddhism, a highly ritualistic religion with a huge pantheon of gods and goddesses, inspired the religious art of Mongolia. As in most religions, there is a need to create cult images in painting and sculpture, as well as ritual objects and other paraphernalia associated with worship of the deities. There was a great deal of cultural exchange and travel between Tibet and Mongolia. Tibetan lamas proselytized in Mongolia, and Mongolians went on pilgrimages to Tibet. There was even a fusion of the art styles of the neighboring countries India, Nepal, and China. The local crafstmen in turn copied these religious objects, often of a high artistic caliber. Mongolian artists, like their Tibetan counterparts, followed the prescriptions of religious texts in order to create a sacred image. The sculptor or painter fashioning the image of a god had to comply with the iconography and proportions of that particular deity set down in the religious texts. - Buddhism is a philosophy espoused by Siddhartha Gautama approximately 563BC, which focused on understanding the path to salvation in a world of constant suffering. Buddha was the name given to Siddhartha by his followers and means "enlightened one". Buddha is sometimes given the title Sakyamuni meaning sage of the Sakka people, after the people into whom he was born. The Manchus were also followers of Tibetan Buddhism, and they, too, produced paintings, sculptures, and ritual objects made in the Tibetan style, not only for the emperors' personal use but also as gifts for the high lamas of Tibet and Mongolia. Many of these Chinese art objects of Tibetan inspiration are known as "Sino-Tibetan" or "Tibeto-Chinese" art. Although a bronze seated Buddha from Tibet may share similar iconography with examples made in Mongolia or China, certain characteristics distinguish the images. Buddhist sculptures have in their statuary hand gestures and they have specific meanings (Hand Gestures - Mudras - Symbols of Deeper Meaning). In the late seventeenth and early eighteenth centuries, the sculptor par excellence among the Buddhist countries of Asia was Bogd Gegeen Zanabazar (1635-1723), the first Juvchindamba Khutagt, or Bogd Geegen, and the greatest sculptor of Mongolia. His artistic talent was already apparent when he was a young boy, when he was observed to be fond of drawing and building houses and temples with his little friends. At the age of fourteen he went to Tibet, where he was ordained by the Panchen Lama and proclaimed Jebtsundamba Khutuktu by the Fifth Dalai Lama. At that time the Potala Palace was being reconstructed, and Zanabazar must have come in contact with the many artistans and craftsmen at work in Lhasa. Upon his return to Mongolia in 1651, he was accompanied by hundreds of Tibetan lamas and many artists and craftsmen, sent by the Fifth Dalai Lama to propagate the faith and to build monasteries. The most outstanding sculptor of Mongolia was the First Bogdo Gegen, Zanabazar. His statues are far more alive in expression and body, and more broad shouldered than Tibetan ones. The postures are canonical, but give an impression of great stateliness. His female statues, such as of the twenty-one Taras, are more sensuous than Tibetan counterparts. Mongolian sculpture follows his style. The sculptures of the Zanabazar school are generally made in two pieces; the body and the pedestal are made separately and then soldered together. The smaller sculptures are made in one piece, and sometimes a mold was used to produce multiple wax models. Most of the sculptures are gilded, and the mercury gilding is especially beautiful. Following Tibetan tradition, the lotus pedestals of the sculptures by Zanabazar and his school are distinctive. Instead of the oval and rectangular throne types common in Tibet, they show a preference for circular or drum-shaped pedestals and semioval pedestals with tall bases. Some sculptures of Outer Mongolia are amalgams of gathered pieces from various places and combined together to form a single sculpture. The base, halo, and even attributes that appear together may not have been intended to do so. It is difficult to say whether this is a Mongolian custom, or one caused by necessity. This is certainly true in Chinese art, as in porcelains and lacquers from the Ming dynasty. - Higlights of the works of Mongolian art displayed in the Zanabazar Fine Arts Museum, the Choijin Lama Temple Museum and the Bogd Khan Palace Museum in Ulaanbaatar. Inner Mongolian Style formerly a large monastic complex and crafts centre in Inner Mongolia and Mongolias most famous bronze workshops. Most of the works known from Mongolian temples were not made in situ (in the Gobi region of southern Mongolia, Oyu Tolgoi contains in-situ metal "copper-gold") but originated in China or Tibet. Actually, some of the so-called Chinese sculptures were made in Inner Mongolia, or by Dolonnor craftsmen residing in Urga (today's Ulaanbaatar). Dolonnor, about two hundred miles northeast of Beijing, is located near the ox-bow section of the Luan River in the old province of Khahar, now the southeastern section of Inner Mongolia.This part of Inner Mongolia is one of the largest producers of iron and coal in China, and Dolonnor, at least through the first quarter of the twentieth century, was famous for its manufacture of Buddhist images in bronze. Many sculptures from the Qianlong period, whether of wood or metal, are similar in style to these Dolonnor pieces. Some of these lamas must have been trained artists. They were a mixed bunch; besides Chinese from the various provinces, there were Jesuit missionaries from Europe and their Chinese students, Nepalese, and, last but not least, Tibetans. There were great schools of Tibetan painting and statue making at Dolonor Monastery in Inner Mongolia and at the various Tibetan monasteries in Beijing. The artists at both places were mostly Chinese. Tibetan thangkas and statues were mass-produced starting in the early nineteenth century in Beijing, and during the second half of the nineteenth century at Dolonnor. They were distributed throughout Mongolia and Buryatia, as well as northern China and Tibet. The Buddhist paintings of Mongolia are directly related to the painting tradition of central Tibet. They can be painted on white, red, or black backgrounds. They are executed on cotton stretched on a frame. The cloth is first sized with a solution of chalk, glue, and arkhi (milk vodka), and then polished with a smooth stone when dry. The image is then drawn in charcoal according to the proportions in the shastras, or sometimes the artist may use a pounce. The pigments consist of mineral and vegetable colors, mixed with yak-skin glue. The finished piece is framed with silk brocades from China, and a thin stick and a wooden roller are inserted at top and bottom for hanging. Mongolian paintings are noted for their fluid line work, contrasting colors, and the intricate designs in gold. Characteristic Mongolian elements can be detected, such as the lotus pedestal in thangkas. There are also present the five principal animals (camel, horse, yak, sheep, and goat), soft peaks, and colorful clouds. The appliqué (zeegt naamal) of Mongolia is like a giant thangka or painting. The embroidery needle and thread take the place of brush and ink, while pieces of silk and brocade are transformed into areas of color. Where one finds gold highlights in Buddhist paintings, in appliqués one finds gold threads, carefully couched along the edges, and golden brocades are cut into jewellry shapes. Appliqué thangkas came into Mongolia together with Vajrayana Buddhism. Mongolians are familiar with this technique for the excavated felt carpet of the Huns from the Noyon Uul burials already showed a combination of embroidery and appliqué. The Urga (today's Ulaanbaatar) area is especially renowned for its appliqués used for decorating temples and palaces. Appliqués are called "silk paintings" in Mongolia because silk and brocades were used for garments and accessories such as belts, hats, and purses. In the monasteries, silk is utilized in many ways; to clothe lamas and deities alike; for cushions and throne backs; for canopies; and for framing thangkas. Appliqué are further ornamented with tiny coral beads, such as coral, pearls, and turquoise is a purely Mongolian practice. Chinese style Tibetan statues, for instance of forceful protector figures, tended to be more muscular and asymmetrical than their Tibetan counterparts. They usually had slight free-style adaptations not in accordance with canonical measurements. There were used different alloys from those made in Tibet, so that the color of the statues was often lighter. Many Chinese artists were in Mongolia as well, and sometimes their influence can be seen. - Blockprints; pressed from wood blocks onto paper or cloth. - Tsagali; initiation cards, small painted cards used during Tantric initiation ceremonies. - Charts; astrological, medical, and protection talismans. - Murals - wall paintings: the principal art form of Buddhist and Bon religion. The bell and dorjie represents the image that wisdom and method are an undivided unity so the dorjie and the bell are never parted or employed separately. Mandala; geometric models of a pure universe and the archetypal deities. The symbolism of meditation Mandalas has a rich tradition. The outer form of these so-called holy circles is a geometrical diagram, a Yantra, and each detail of its construction has symbolic meaning. The essence or purpose of the Mandala is concerned with the process of invocation, the calling in and realization of the spiritual force within the contemplator himself. All these different picture-tools have essentially the same inner meaning and purpose, but there are Mandalas to suit all levels of consciousness: for the spiritually, for highly developed people, for average people and for people not yet developed. Mongolians realized early that books were essential in disseminating of Buddhism. Although Tibetan was the liturgical language of Mongolia, rulers, both Mongol and Chinese, made sure that the Kanjur and Tanjur were translated into Mongolian and published. Sutra-printing took place in many monasteries of Mongolia, on paper purchased from China and Tibet. The same technique used in painting is applied to book decoration. Texts are outstanding for their lavish ornamentations, with the text embossed on sheets of silver and gilded. Gold, silver, coral, pearls, lapis lazuli, turquoise, steel, copper, and mother-of-pearl, were ground up for use as pigments, and the sutra was written in the nine colors on black paper in a fine calligraphic hand. In general, wood is scarce in Mongolia. Mongol scribes illustrated the title page on paper and then framed it with softwood, which was then embellished with Chinese brocades. The Mongolian style of Tibetan painting maintained the iconography but adapted the details of the background. In Tibetan thangkas (scroll paintings framed in brocade), the backgrounds typically have stylized snow-capped mountains and lakes. In Mongolia, the rolling grasslands and hills of Mongolia are more frequent. The small human figures in the background tend to look more like Mongolians than like Tibetans, and eventually the facial features of the main deities also acquired Mongolian traits. Thus, the faces tend to be larger and rounder than Tibetan ones. The Mongolians also tend to use more shading than the Tibetans to depict body musculature, although this is occasionally found in Tibetan thangkas as well. The Buryats follow the Mongolian style, with some minor variations in details. The Chinese style of Tibetan thangkas had typically bright, garish Chinese colors, in contrast to the more subdued colors of the Tibetans. They had a great amount of gold leaf work, more than the already considerable amount found on Tibetan thangkas. 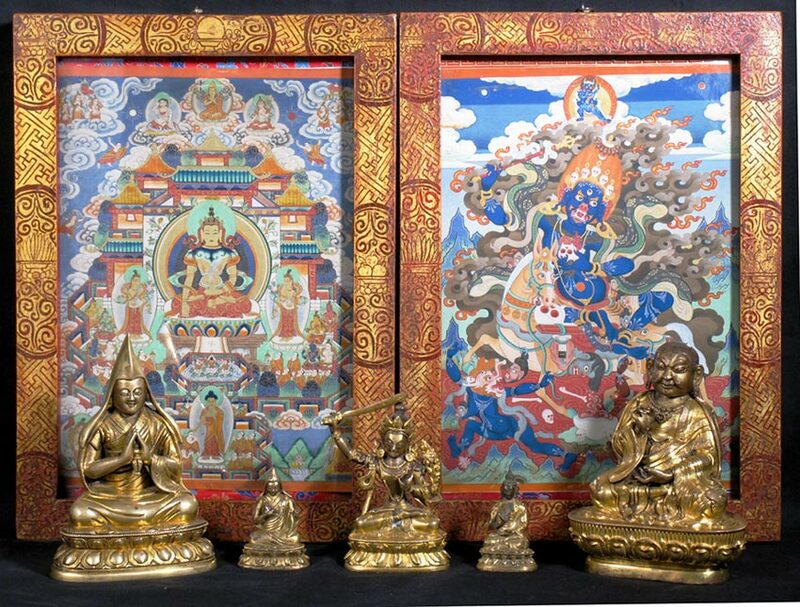 - Mongolian thangkas are colored painted on black, red, or gold background. - Gau; thangkas in brass, silver and copper. The Qianlong emperor of China was known to have remounted Tibetan thangkas in the Chinese style. Sakhuis - Fine Art of Mongolia, which includes the Buddhist bronze sculptures and painting thangkas. The deities depicted in the sakhuis have a vigor and vitality typical of the people of the Steppes. They are thought of as sacred objects and used as amulets. The deities of the pantheon are divided so as to represent the dual nature of all things in the Universe. There are the strong and vengeful manifestations of deities who maintain order through authority and fear, such as Mahäkäla, as well as the nurturing deities such as Tara and Bodhisattva Avalokitesvara. The temple architecture of Mongolia has strong Chinese as well as Amdo-Tibetan influences. Temples often have green tile roofs, not found in Central Tibet. At one monastery, for instance Erdene Zuu, there would be some buildings in pure Tibetan style, with massive walls sloping outwards and windows with black trapezoidal-shaped fringes around them, and next to them buildings in Chinese influenced Mongolian style. Although the external style of the temples was influenced by local customs and tastes, the internal decoration and arrangement of the main prayer halls were standardly Tibetan. There were rows of columns covered with multicolored brocades and thangkas, walls with elaborate frescoes and a wild array of bright colors. The front wall had elaborate, painted cases for scriptures and statues, an enormous statue, usually of Buddha, in the center, and a throne for the Dalai Lama before the main statue. Thangkas were hung wherever possible. Everything was ornate and elaborately decorated. As in Tibet, the monks sat in parallel rows, facing each other, perpendicular to the front of the temple. The chanting was in the Gelug style, using deep bass voices, with monks producing overtones so that each person sings a chord. The long brass horns, oboes, conchshells, cymbals, bells, and drums that accompany Tibetan chanting are found throughout. Copious amounts of salted butter tea is drunk everywhere in Buddhist Central Asia, as in Tibet. Stupe  Suvraga (in the Mongolian language) - a structure of building  the house of holy relics  Spiritual Monument. Heap or cairn, is the Lamaist equivalent of a shamanists´ shrines. This is a heap of bones formed on the stone altar by the remains of sacrificed animals at the tailgan. They would be inhabited by local spirits. Mongolian people's local deities (nibdagh and shiddagh).